It’s a very personal story. Australian-born Craig Gillespie is recognized for his sharp, offbeat comedy, intuitive eye for casting, and uncanny ability to inspire reality-based performances, Gillespie has received critical acclaim for his signature work as a feature film, commercial and television director and now brings his visual artistry to the spectacular The Finest Hours. 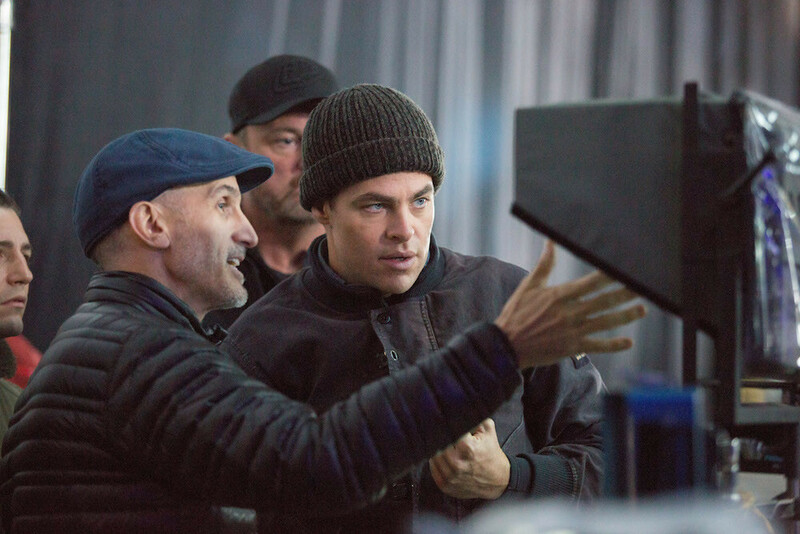 Director Craig Gillespie with Chris PIne on the set of The Finest Hours, a heroic action-thriller based on the most daring rescue in the history of the U.S. Coast Guard. What was it that originally attracted you to the project? What I loved about this script is that it really makes you think about what you would do if you were given the choice of stepping up and doing something which takes a lot of courage for someone other than yourself, and I love that premise. There was a purity to the generation of men in our story, and they often did put others before themselves and, that’s what made them so heroic. There are a lot of thrills in this story and the scale is huge, but in the end it’s a very personal story. What I loved about the script is that Bernie Webber has so much heart—he’s such an interesting, lovable character. He’s the guy who you feel is not going to amount to much…and then he surprises everybody. It’s a true story which took place off the coast of Cape Cod in February of 1952 when a massive storm with 70 mph winds struck. Two oil tankers were split in half and one of them was able to issue an SOS distress call, but the other one, the SS Pendleton, split so abruptly and quickly that the bridge sunk with all its communications equipment aboard and they weren’t able to radio for help. The back half of the ship stayed afloat and drifted down the coast past Chatham on the Cape where someone saw it and went to the Coast Guard station to report it. The tanker was trying to stay afloat, so they rigged up the tiller with chains and started up the engines and beached it so they wouldn’t sink and tried to wait out the storm. Then, one lifeboat which was 36 feet long and built to carry 12 people and which no one believed could get out across the bar with the size of the surf that was resulting from the storm, went out with four young men aboard—in subfreezing weather—to try and rescue 33 men on board the Pendleton. The story is not that well known, but it is actually the greatest small boat rescue in Coast Guard history. 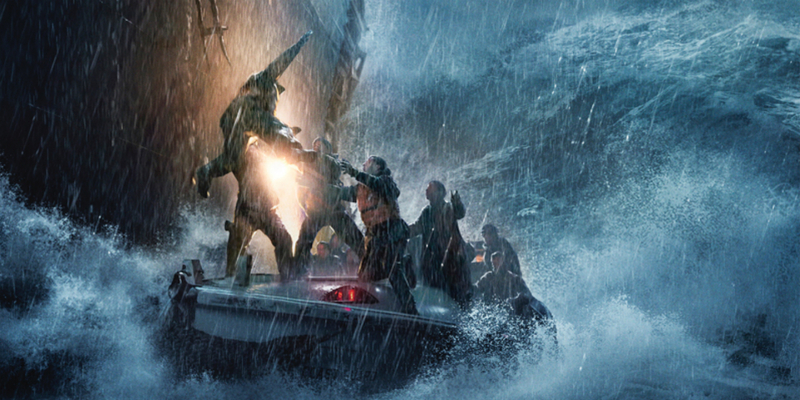 I read the script first, and then when I read the book I really enjoyed how very true the writers stayed to the events and the timeline of when things occurred, which is almost unfathomable considering all that was going on out there in the ocean. 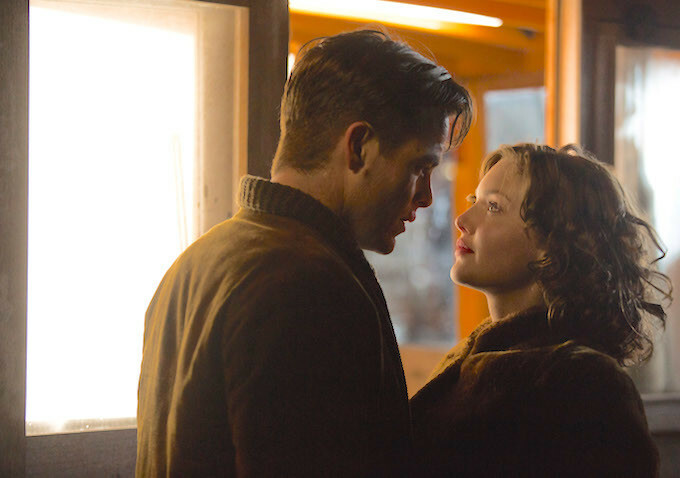 Can you talk about Chris Pine’s character Bernie Webber and his relationship with Miriam, played by Holliday Grainger? Bernie Webber is this incredibly sincere, sweet guy, who has a very straightforward outlook on life, and Chris Pine has done an amazing job making him this lovable, sincere, honest fellow that you root for. Bernie is a coxswain for the 36500 lifeboat who was 24 years old the night of the rescue, and he wasn’t part of what you would call the Coast Guard’s A-Team. When this disaster happened, the A-Team got called upon to go to the SS Fort Mercer, which was quite a ways out to sea. Bernie did what he was told, even though everyone knew the SS Pendleton rescue mission was close to impossible. At the beginning of the story the fact that he always does what he is told is almost a detriment, but as he goes through this journey we see that he comes into his own and becomes a thinking man: someone who makes his own choices and becomes a true leader, and that was something that Chris was able to beautifully portray through the nuances in his performance. He really got to create a character with Bernie, using everything from his mannerisms to his accent, and the evolution of such a fully-fleshed character surprised me at every turn, especially because the audience views him as the underdog. We set him up that way, and Chris just makes Bernie shine on screen. Miriam is this very independent woman which feels a little unusual for that time period, but she actually ends up challenging Bernie to think for himself. Portraying a powerful woman is such a great opportunity for an actress, and Holliday does a superb job of maintaining that fine line between being strong but not too intimidating. And she’s doing everything she can to try and help out from the shore in terms of dealing with Bernie’s superiors and dealing with the town and rallying those efforts, while he’s literally out on the ocean fighting for his life. The chemistry between her and Chris is just beautiful, and you really are yearning for them to end up together. We wanted to be very specific, very clear and technically accurate, and in the film we portray exactly how Bernie and Miriam met (their first date with her in that fur coat is verbatim from the story). Being able to get those nuances and truths makes it all more interesting and allows us to present such unique individuals, and both actors were so great at being able to run with it. What can you tell us about Casey Affleck’s character, Ray Sybert? The interesting dynamic on the Pendleton is that when it sunk, all the officers aboard died. They were all on the bow of the ship, so there was really no clear command of who should actually be in charge, and Sybert becomes a reluctant hero, the antihero. He does not like authority, and the dichotomy here is that when the situation happens he has to step up and rally the crew, becoming, in essence, the person that he detests. Ray has always avoided that by working down below in the bowels of the boat and not having to take on the onus of the authority and the weight of having to carry that responsibility. That’s the struggle that we found so interesting, and Casey really did a beautiful job working through that, becoming a leader for the men and having to do that to save all of their lives. It’s a fine line when you’re working with an actor who has the patience and the commitment to the character which you hope will translate on screen, because a lot of times it’s like these very small moments. And Casey takes his time with these interactions and just the choices that he makes as a performer, which don’t seem obvious or exactly where you think he would be going. It just builds throughout the movie to make a very interesting, complex man who’s got these issues that he’s struggling through, and it makes the audience go on this journey with him in a way a director can only hope for. Talk about the rest of the cast. Ben Foster is playing this rough, tough guy; he’s got all these eccentricities, which I love; he’s brought such intelligence to it all. Ben is a contrarian to Bernie. He sort of informs the audience on how the rest of the Coast Guard station feels about him. You get the sense from him that Bernie is very much the B-Team. He hasn’t earned the respect yet that the A-Team has at the Coast Guard station and we see that all through the eyes of Ben’s performance. He gives him a hard time. He calls him on things and questions him, and then you see that respect that is earned throughout the film from Ben’s point of view. And he does such a beautiful job with those touchstones throughout the film, and they have a moment at the end of the film which I think is just beautiful. Eric Bana is a man with a strong presence, and it was great to see Eric manage to make him a more insecure and unsettled person. He plays Daniel Cluff from the Chatham Coast Guard Station and Eric, who normally has this very strong, intimidating presence, plays this really insecure guy. Cluff has only just arrived at the Coast Guard station from Virginia. He hasn’t proven himself in front of these men yet and he doesn’t actually know this world. He doesn’t know the East Coast and the nor’easters and how it all works, so he’s second guessing himself and we need to feel that throughout the film, because it was not a wise choice to send these men out…it turned out okay in the end, but a man with more experience probably wouldn’t have done it. And so Eric had to bring all those nuances to his performances and he did an amazing job with it. Can you talk about Andy Fitzgerald and Mel Gouthro and their involvement with the production? I didn’t actually meet them until they were on the set, so it was actually a little nerve-racking, but they were very modest about everything and just shrugged when anyone called them heroes. It wasn’t this sense of awareness of the life and death nature of what they did and the jeopardy that was involved…it’s like it was unquestionable, like it was just the thing they did, which is how it was with Bernie. He said he never really talked about it afterwards and that it was years before his wife even realized what a big deal it was. They just went on with their lives. Can you talk about the epic scale of the story and what that entailed in terms of visual effects? There are several scenes in this film that I would describe as rather intense. The crossing of the bar sequence was a big topic of discussion and required a lot of preparation and a lot of research and development, and we really couldn’t find any reference for that kind of CG work. It needed to look completely convincing, and it was really exciting to see it come together. We shot in a tank since you can’t replicate 70-foot seas which was in an old shipping yard and built all of these sets. So even though we’re shooting against blue screen, we had an engine room that was made of steel and was 65 feet tall that rocked with 10 feet of water in it. These guys were rocking around in a full-scale set with 2,000 gallons of water coming down through, the windows. So they were very much in an environment that was quite brutal, but which helped inform their performance. An appreciation of what these men went through. I think it’s going to be surprising for the audience to be able to sit in this world and be in the space that they were in, especially in 3D. It’s all consuming, and I hope we really captured the enormity of it and what they went through.